Report on the World Championship in Knife- and Axe Throwing, August 2014, Callac-de-Bretagne, France. 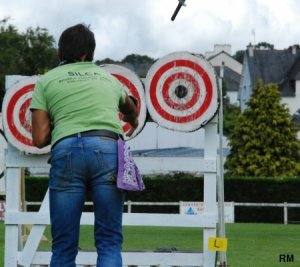 This championship was not only a Big Throwers Meeting with knife throwers and axe throwers from 12 nations, but also a festival for the town of Callac in Brittany, France. The organiser, Lanserien Kontili Breizh (president and driving force: Pierre Cazoulat) came up with quite some interesting twists to make the competitions more compelling, for both spectators and competitors. World Championship - that's the first time that the EuroThrowers employ this big word for their annual championship. Based on a 14 year history of international championships, the "world" claim comes natural: 147 participants (33 women, 114 men) from 12 nations came to compete and determine the world's best knife throwers and axe throwers. From 7 countries, there were even teams of at least 5 competitors. In fact, from all the countries in the world where the sport of throwing is more widely practised, only the USA (4 participants) and Indonesia didn't manage to have a full team. The first place in the country ranking was won by the Czech Republic, followed by Germany and France. For the sportsmen, there were some creative new events to ensure that the fun of throwing and the fun of talking with other throwers didn't come short: sticking your knives around a silhouette of Cleopatra, high-speed throwing (stick as much knives as you can in 20s - attention rebounds), and the triskell elimination contest. A new style of throwing was tested in the "instinctive throwing" event. In traditional knife throwing, the knife turns in flight end-over-end. Here, only half a rotation or no rotation at all were allowed. That means that a whole new throwing move had to be learned, kind of a pushing whip motion. Only 23 participants opted to compete in this no-spin throwing. As was to be expected, the event was dominated by Russian throwers who do practice this style since some decades under martial arts aspects. Spectators experienced the championship as a festival. Six thousand visited the site over the three days, not only watching the competition but also browsing the sideshow: craftsman booths demonstrating leatherworking, knife forgers, food from local traiteurs to organic burgers, and an area with traditional Breton games for the too-young-to-throw. A timbersport group demonstrated their skills in an extra area. To increase suspense, most events culminated in extra finals, held directly at the main tribune in front of all spectators (" Hundreds of pairs of eyes in your back make accurate throwing more difficult to some degrees. "). The most important finals were held in precision throwing: For the title of World Champion (women and men, knives and axes separately), the competitors had to make their 3 throws from the first distance, then immediately move back to the next distance for their next throws, until reaching the 7m ("walk-back mode" similar to the US championships). Here, there was no time to get accustomed to the new distance with some throws, so only the best 20% of the throwers were admitted. One event is not yet part of the official canon of competitions (so far precision and long distance), but after four years of successful refinement ripe for inclusion: The Duel Cup. In the Duel Cup, after a signal you have to stick your knife into the target before your opponent does - only the winner goes on to the next round. Since the athletic level got rather high over the years, it is no longer feasible for human judges to tell who was faster. So, for the first time, electronic measurement devices were deployed that registered the impact of the knives (invented by Walter Steinbeck from Germany, and built for Callac by José Louarn. Walter's plans will be published under an open license). In the semi-finals, the call was so close that even the machine couldn't tell the difference - the decision was thus taken based on the distance of the knives to the target centre. In the Duel Cup as well as in the long distance events ( 4 new records! ), the suspense provided for a total silence in the stadium. Ivan Dolgikh (RU): A perfect celebration of knife throwing. John Taylor (UK): I have just returned from the Eurothrowers World Knife and Axe Throwing Championships in Callac, France, organised by Pierre Cazoulat and lots of volunteers and sponsors. As always the throwers there make you feel you are part of one big happy family, but what made the Championships truly spectacular was the fantastic organisation, the brilliant location and lots of hard work by the organisers. The EuroThrowers association makes sure there is one common championship each year, and negotiates standard rules. The event itself is organised by a member club - for Callac the LKB. For more than a year, it's members were busy planning the event, and recruiting 50 volunteers to act as judges, point takers and security (at the entrances to the competition and training areas). Everything was taken care of - down to regular checks of the stability of the training targets. The icing on the cake were the double bookkeeping of the scores, and the certificates individually rendered by calligrapher Maurice Gael. One logistic challenge remained: Especially the top throwers got ahead in parallel events, and had to be piloted to the right throwing ranges using announcements and search parties. This was, to the best of my knowledge, the first really international World Championship of Knife and Axe Throwing in history. No wonder some well-known figures from the early days of the sport showed up (including 7 founding members of the EuroThrowers), for example Benjamin Simon (who operates the French throwing website), Michel Dujay (author of a very early throwing instruction video), or Christian Scholle-Prestin (organiser of the first three international competitions at the LBHR near Berlin). Callac was also the place to meet for the first time in person with freshly committed knife throwers like Janos Kohl from Hungary (who translated the competition handbook). At the championship dinner in the town hall, Pierre Cazoulat was greeted with standing ovations. In the friendly ambiance, you got the feeling that at each and every table there are some friends in throwing which whom you'd really like to spend the evening chatting. The World Championship in Knife and Axe Throwing was a success all around. For the participants, who had fun training and competing in challenging events in an amicable ambiance. And for the spectators, who - grace to a compelling supporting program and finals full of suspense - often came for several days. Thank you very much, Pierre Cazoulat and all the helping hands from LKB and Callac, for organising this championship! The 2015 EuroThrowers Championship will be held in the UK (Robin Hood county! ), on the weekend of the 22nd August 2015. Registration will be announced at KnifeThrowing.info/Championship. Roberto Murgioni, thank you for the photo marked RM. Ivan Dolgikh: Article et photos, video "28 knives - 20 sec", video "Duel Cup"
Yuri Sokolov: Photos, video "Overview day 1", video "Overview day 2"
A big Thank You to all the people that made this World Championship possible! Linder, Muela, Intermarché, de Colonna, Tempo Grille. Knife and Axe: Long distance; Cut off once the qualification-distance for the finals is achieved (11m knife / 13m axe). For each event, the thrower has to show up with a set of three throwing tools (knives/axes), of uniform shape and material (same "model"). Exceptions only for throwing tools damaged during the meeting. For the precision events, there will be four combined rankings: For women, men, knives and axes separately. Knives combine the 3m, 5m and 7m events, axes combine the 4m, 5m and 7m events. The combined precision rankings are the basis for the finals of the World Championship Precision, and the ranking of countries. There are no other ranking that combine several events. The final in the Long Distance event will be held separately. 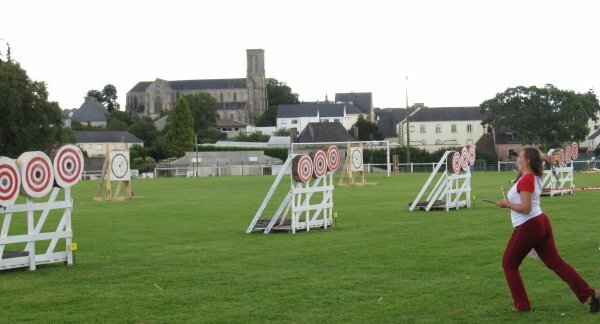 Throwers that qualified by reaching the set distance (see above) will start with three test throws (to be effectuated between 4m and 10.99m for knives and between 5m and 12.99m for axes), before the event resumes following the standard rules (minimum starting distance 11m for knives, 13m for axes). Pairwise throwing: Who hits the target faster. For the first time, an electronic system will determine which thrower sticks it first! The Duel Cup rules have been changed from last year's, to incorporate details on the duel measuring device, among other things. For the title of World Champion in Knife/Axe Precision Throwing , we keep close to an event established in the USA (IKTHOF club). It will be held in walk-back-mode. Only the 20% best throwers from the standard precision events (including axe 5m) are qualified for this event. Minimal number of participants: men 20, women 5. The thrower will throw at 4 target groups (we say he makes 4 "runs"). At each target group, he will throw one round of three throws per distance mark - starting behind the closest distance mark and moving back behind the next distance mark after completing the previous one. He will thus throw at all his distance marks in one run. The maximum number of throws in one run at a target group is thus: 5 distances x 3 throws per round = 15 throws. The distance marks given are minimum distances (that is you can go further back, but not closer to the target). In addition, between two rounds there must be a minimum distance of 0.7m *. Example: Arriving at the target group with your knives, you start your run standing behind the 3m line at 3.2m. You throw your round of 3 knives, and get scored. Immediately you start the next round by moving back behind the 4m, at 4.50m. You throw 3 knives, and get scored. You go back (to minimum 4,5m+0.7m=5.2m), throw, get scored. This continues until you got scored for throwing behind the furthest distance mark. Then your run at this target group is completed. The ranking will be based on the 5 best throwers of each country (standard distance ranking, not the world championship one). Countries with less than 5 participants who have thrown the full standard precision events will not be included in the ranking. A one-on-one event. Distance 3m. Detailed Triskell rules: PDF / OpenOffice. Put as many knives in the target as you can in 20 seconds. Distance 3m. Detailed speed throwing rules: PDF / OpenOffice. Knife throwing into targets that are grouped around a silhouette. Hits inside the silhouette will cost you a penalty of minus 10 points. Distance 3m. Detailed silhouette throwing rules: PDF / OpenOffice. The rotation of the knife is mandated: none, or a half. Can be chosen freely for each throw of the event. First run: Throwing from mandated distances (3, 4, 5, 6, 7m). Second run: Throwing at targets that are fixed at different heights (bulls eye from 0.5m to 1.6m off the ground), from distances unknown to the thrower (between 2m and 8m). Detailed instinctive throwing rules: PDF / OpenOffice. * For the event World Championship Precision we discussed multiple options to ensure that each participant throws at 5 different distances (problem "3.99m and 4.01m"). The current option was chosen for this year because Pierre favoured it vehemently. The other solution with the same number of votes was simply imposing that a thrower be standing with both feet in the zone between two distance marks.